Food Bank For New York City — the city’s major hunger-relief organization working to end food poverty throughout the five boroughs — raised more than $2 million this week at the organization’s annual Can Do Awards Dinner at Cipriani Wall Street. Dorothea Bongiovi, MSNBC and Toyota were honored for their commitment to eradicating poverty and hunger. 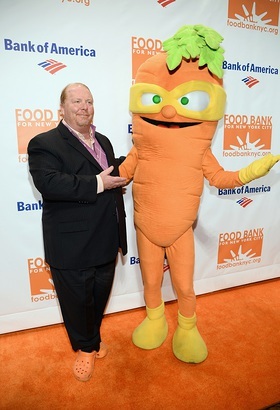 Presenters included Mario Batali, Tom Colicchio and Chris Canty. Notable attendees included Jon Bon Jovi, Selita Ebanks, Josh Charles, Rachael Ray, Ted Allen, Michael Stipe, Michael Potts, Lori Silverbush, Lauren Bush Lauren, David Lauren, Jill Hennessy, David Burke, Katie Lee, Kelly Bensimon, Countess LuAnn de Lesseps, Nastia Liukin, Sasha Cohen, Alysia Reiner, Joe Morton, Bevy Smith, David Alan Basche, Mary Giuliani and Phillip Baltz. Aaron Neville was the evening’s special musical guest. Cat Greenleaf, host of NBC’s “Talk Stoop with Cat Greenleaf,” emceed the event. The Can Do Awards Dinner is the premiere Food Bank For New York City event that helps support the nearly 1.5 million New Yorkers who rely on their programs and services to put food on the table. As the city’s hub for integrated food poverty assistance, Food Bank tackles the hunger issue on three fronts — food distribution, income support and nutrition education — all strategically guided by its research. Through its network of community-based member programs citywide, Food Bank helps provide 400,000 free meals a day for New Yorkers in need. Learn how you can help at foodbanknyc.org.